Many cross-sectional studies show an inverse association between dietary magnesium and insulin resistance, but few longitudinal studies examine the ability to meet the Recommended Dietary Allowance (RDA) for magnesium intake through food and its effect on insulin resistance among participants with metabolic syndrome (MetS). The dietary intervention study examined this question in 234 individuals with MetS. Magnesium intake was assessed using 24-h dietary recalls at baseline, 6, and 12 months. Fasting glucose and insulin levels were collected at each time point; and insulin resistance was estimated by the homeostasis model assessment (HOMA-IR). The relation between magnesium intake and HOMA-IR was assessed using linear mixed models adjusted for covariates. Baseline magnesium intake was 287 +/- 93 mg/day (mean +/- standard deviation), and HOMA-IR, fasting glucose and fasting insulin were 3.7 +/- 3.5, 99 +/- 13 mg/dL, and 15 +/- 13 muU/mL, respectively. At baseline, 6-, and 12-months, 23.5%, 30.4%, and 27.7% met the RDA for magnesium. After multivariate adjustment, magnesium intake was inversely associated with metabolic biomarkers of insulin resistance (P < 0.01). Further, the likelihood of elevated HOMA-IR (>3.6) over time was 71% lower [odds ratio (OR): 0.29; 95% confidence interval (CI): 0.12, 0.72] in participants in the highest quartile of magnesium intake than those in the lowest quartile. For individuals meeting the RDA for magnesium, the multivariate-adjusted OR for high HOMA-IR over time was 0.37 (95% CI: 0.18, 0.77). 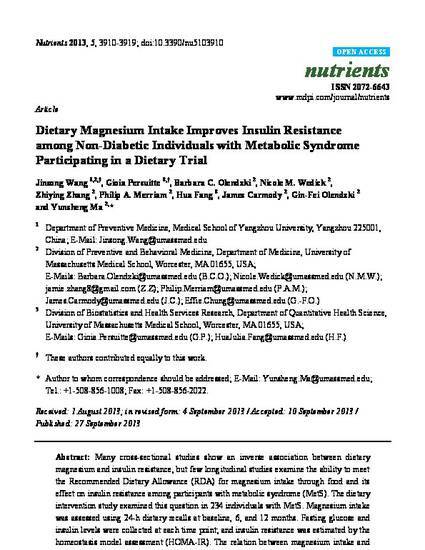 These findings indicate that dietary magnesium intake is inadequate among non-diabetic individuals with MetS and suggest that increasing dietary magnesium to meet the RDA has a protective effect on insulin resistance. Copyright 2013 by the authors; licensee MDPI, Basel, Switzerland. This article is an open access article distributed under the terms and conditions of the Creative Commons Attribution license (http://creativecommons.org/licenses/by/3.0/).